BaroqueAgain1 wrote: TVG just passed along the sad news that Jeter has died. II think they said he had signs of colic and reared over. Missed the rest of the sentence, but perhaps he injured himself fatally? Hard-knocking gelding with a lot of back class. Jeter, the popular 9-year-old gelding named after the popular former Yankees shortstop Derek Jeter, died earlier this week, trainer Ed Barker said Thursday. 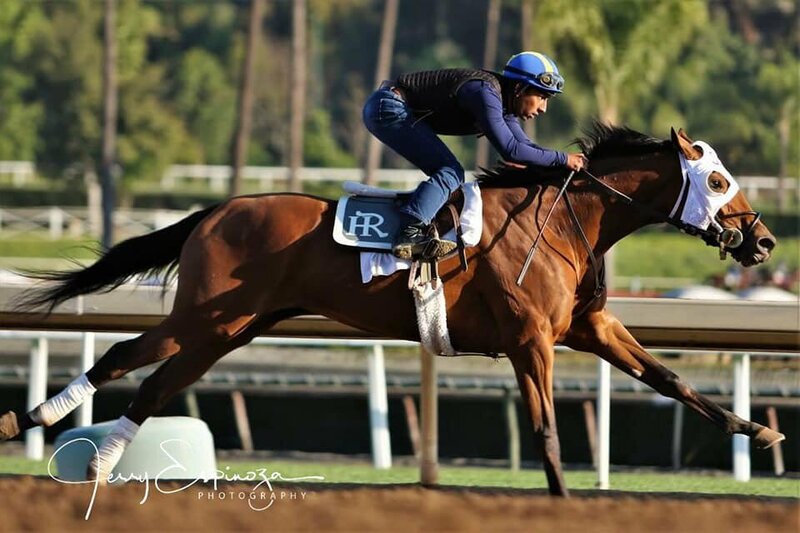 Jeter was entered to run Thursday at Aqueduct. According to Barker, Jeter showed signs of colic on Tuesday morning. A veterinarian who was on the other side of the barn, tried to treat Jeter. According to Barker, the horse reared and fell. "I personally think he had a heart attack," said Barker, who said a necropsy would be performed. Jeter started 69 times, winning 8 races with 13 seconds and 14 thirds. He earned $426,049. "He's going to be missed, I'll tell you that," Barker said. "He was an old war horse." 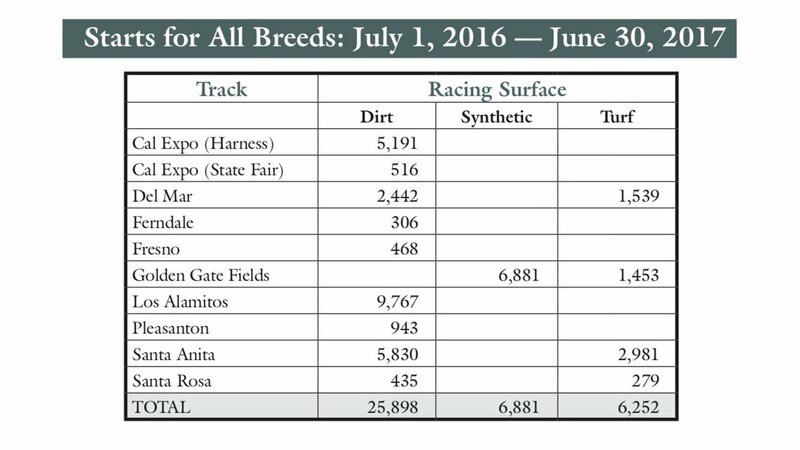 For a relatively small track, Los Al had a lot a fatalities, especially in the "Other" category. Do those figures include the Quarterhorses who race there? Evidently, all Cali tracks should look to Ferndale for guidance. I think that’s the one track in CA at which I’ve never attended the races. I’ve been there, just never during the race meet. Attractive venue, too bad it’s such a pain to get to and it runs during Del Mar and Stronach is trying to kill it. It’s cut off but “other” is non-racing related - accidents in stable, colic. BaroqueAgain1 wrote: For a relatively small track, Los Al had a lot a fatalities, especially in the "Other" category. I was just wondering that- with those short distances and instant speed they need. The Brick broke down at Turfway. 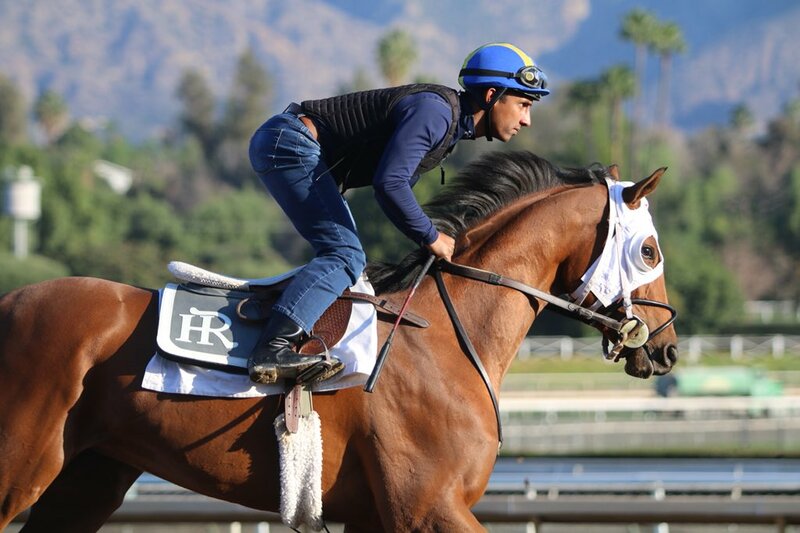 Del Mar Darling 3yr old filly by Misremembered, injured in the 4th at Santa Anita, reported euthanized. Distilled, a Grade 2 winner in the U.S. and pensioned sire residing in Korea, died on Jan. 10. He was 20. The son of Hennessy was bred in Kentucky by Craig Singer, was acquired by owner Dogwood Stable, and placed in the barn of trainer Todd Pletcher. He spent his 2-year-old campaign in New York, and broke his maiden at Aqueduct in his fourth start. Distilled was moved to Gulfstream Park to begin his sophomore campaign. Racing in the allowance ranks, he ran second to eventual Kentucky Derby winner Monarchos. A front-runner, Distilled won an allowance in mid-March, and was sent to Sportsman’s Park for the Grade 2 Illinois Derby, where he led at every point of call to win by 1 ¾ lengths. The colt was placed on the Triple Crown trail after his Illinois Derby win, but that was derailed in his next start, when he was pulled up in the Grade 2 Lexington Stakes at Keeneland with a suspensory injury. He returned after an 11-month layoff to race once as a 4-year-old at Gulfstream Park, finishing an even third in an optional claimer. Distilled retired with three wins in 12 starts for earnings of $378,410. He was exported to Korea after his retirement and stood his first season in 2003. Rest in peace, Dan Perlsweig. If I live forever, this will remain one of my favorite photos, days, stories, memories, honors. 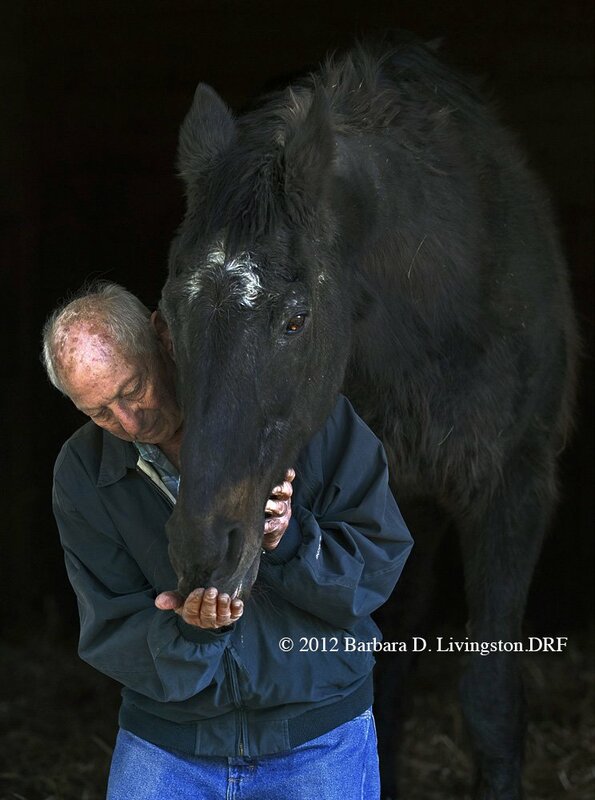 86-year-old Dan Perlsweig visiting his old trainee, champion LORD AVIE, when Lord Avie was 34. In 2012, at Blue Ridge Farm, Virginia. 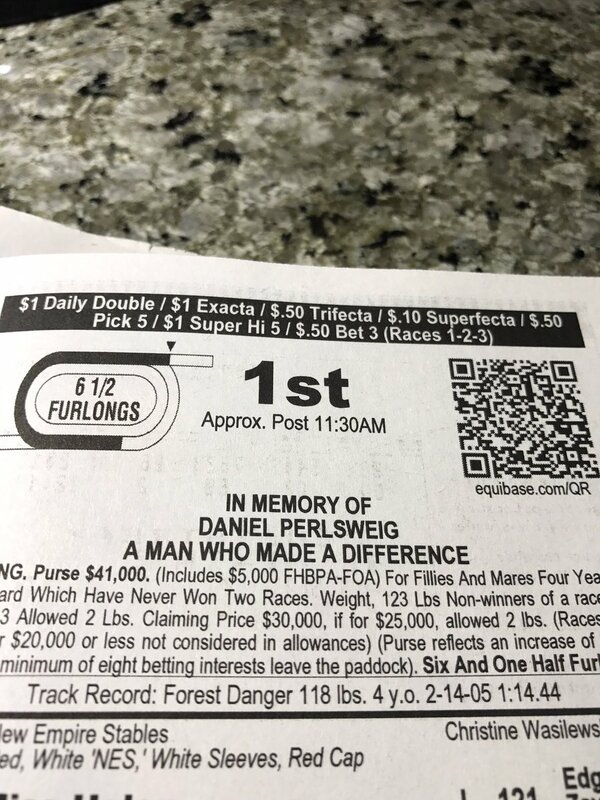 Dan Perlsweig, the trainer of 1981 GI Florida Derby winner and 1980 2-year-old champion Lord Avie, passed away Tuesday due to complications related to old age. He was 91. Sparrow Castle wrote: Rest in peace, Dan Perlsweig. A beautiful and touching photo of two great souls. May they never part again. Sweet picture! May they both RIP. Gutted for Silverado Mist. She was sassy and opinionated. She didn’t love to have her blanket put on & she hated to be behind other horses on the tow ring. As much personality in a little body as you could have but sweet enough to let Olivia ride her around. RIP Misty. John Brunetti, the South Florida real-estate mogul and horse owner who has owned Hialeah Park for the past 40 years, died on Friday at his Florida home in Boca Raton, according to friends of the family. Brunetti, 87, had recently had a cancerous lung removed and had been in failing health for several weeks. The son of a real-estate developer who immigrated to New York from Italy, Brunetti purchased Hialeah Park in 1977, adding the track to his own burgeoning real-estate development business. Over the next 40 years, the fortunes of the historic track, widely considered to be one of the most beautiful racing facilities in the world, would rise and fall along fault lines that were exposed by the deregulation of racing dates in South Florida nearly 20 years ago and the expansion of gambling in the Sunshine State. Throughout the first two decades of Brunetti’s ownership, Hialeah and Gulfstream fought over control of the prime winter dates on the South Florida racing circuit, with Gulfstream steadily gaining ground on what were considered the prime, middle, dates, despite Hialeah’s long history as the preferred winter destination for Northern racing stables. In 2001, the state racing commission decided it would no longer approve racing dates, and after a final season of late-winter dates, Brunetti closed the track. Yes, that is nice to see! "A Man Who Made a Difference" says a lot about one's life. And thus it begins. There is so much sadness mixed in with the happy time. Condolences to everyone connected with Mourinho.